What Is Your Most Annoying Personality Trait Based On Your Zodiac Sign? Aries (March 21 – April 19): Argumentative and mean. Aries like to verbally assault anyone who angers them and will argue anytime, anywhere, anyplace. It doesn’t matter if it’s with family, friends, or complete strangers, they’ll get loud and aggressive in their attempt to control and dominate others around them. Often it can escalate to the point where their behavior is embarrassing and resembles that of a child throwing a hissy fit more than an adult. Taurus (April 20 – May 20): Lazy and always in the way. Taurus are headstrong people who are at their most annoying when they stubbornly refuse to move. Whether it be moving off the couch or forward in their lives, they will simply stay in one spot and not make any effort or even try. While Taurus may want it all, they don’t want to do anything for it, because they’re stubborn and set in their ways! Gemini (May 21 – June 20): Gemini are unpredictable, and not in a good way. They are constantly making plans left and right and then canceling them because they’re flighty and always changing their minds. This total lack of self-awareness, and the lack of social grace that accompanies it- which others pick up on, makes them appear childish and deceitful. Make up your mind and stick with it! Cancer (June 21 – July 22): Sensitive and insecure. You know those people who always need reassurance for everything they ever do, and if they don’t get it they automatically assume you hate them or something bad like that? That’s probably an annoying Cancer you’re dealing with because they’re moody, paranoid, and melancholic. They will mope around feeling bad for themselves and assume everyone is talking bad about them behind their back, when that’s hardly ever the case. 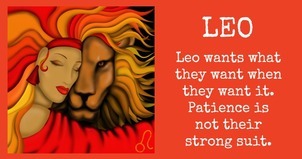 Leo (July 23 – August 22): Arrogant and vain to a fault. Leos have an over inflated ego and fancy themselves to the extreme because they excel at just about everything they ever do. Others are always following them around and while they are natural born leaders, after awhile it makes them think they’re amazing and can do no wrong. Their constant need for any and all attention centered on them makes them seem annoyingly brash and narcissistic. Virgo (August 23 – September 22): Fussy micro-managers. Virgos are perfectionists who are always on time and who don’t take other people’s criticisms lightly. They’re set in stone when it comes to their specific way of doing things and will try to nag you into following in line. That, in combination with their complete lack of flexibility, can be utterly annoying to others who don’t meet their expectations. Libra (September 23 – October 22): Being hesitant people-pleasers. Libras can’t seem to ever make up their minds which gets them pressured into situations and decisions they never would have been in or made in the first place. They try way too hard to avoid offending anyone but just come off as trivial and wishy-washy. If they could simply step up, tell the truth and how they really feel, they’d be less annoying to deal with. Scorpio (October 23 – November 21): Self-righteous and demanding. Scorpios may appear harmless, even kind of weak on the outside, but they put up a facade and are quite calculating. They play by their own rules to manipulate and control things and all their two-faced fakery gets annoying real quick. Sagittarius (November 22 – December 21): Always on to the next big thing. Sagittarius can be really shallow and superficial at times and are constantly trying out the newest, hottest trends. They’ll try to get you on board with whatever fad is hip at the moment and won’t take no for an answer. Their detached stubbornness not only makes them sound dumb, but obnoxious too. Capricorn (December 22 – January 19): Adamant and full of themselves Even though Capricorns may be shy, they’ll use you to get whatever it is they want or desire. They’re ruthless, stubborn and always think they are right, which makes them come off as smug self-centered jerks. You’ll know they’re judging you because they can’t stop rolling their eyes. Aquarius (January 20 – February 18): Not being true to themselves. When anyone tries too hard to be something they’re not, it’s annoying to watch. When an Aquarius does this, it’s even more irksome because it’s so unnatural for them that they just end up acting all sorts of weird. Their offbeat, aloof mannerisms are a bit much to put up with, but if they tone it down a bit, they can be tolerable. Pisces (February 19 – March 20): Never on time and spaced out. 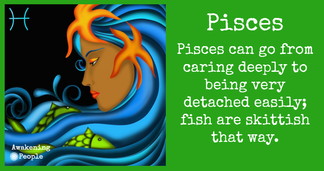 Pisces have no concept of time and subsequently they end up making people wait… a lot, which gets really tiring, really fast. They always seem half asleep because they’re always lost in their own world and when you interrupt their daydreams they come crashing back to reality, which they don’t want to deal with. The Sun Gazing Community was born out of a growing awareness that suffering is anoptional state of being. Through our postings, we have sought to encourage all those seeking spiritual progress in their daily journey.We don’t profess to have all the answers. Joy is there for the taking. In creating this website we hope to broaden the scope of what we have begun. Through mutual sharing, together we can continue on this path, working to change hate into love, judgement into tolerance, self-hate into self-respect, despair into hope, and isolation and loneliness into community. Follow Sun Gazing on Facebook. Artlces were published on Awakening People with explicit written permission.